Our clients rely on us to help them navigate their changing financial landscape and life events so they can spend more time with the people they love and the activities they enjoy. Retirees and corporate executives find our independence and 30+ years of experience particularly valuable. Bob Smith in the news! Retirees, and individuals about to transition to retirement, appreciate the in-depth services that we provide. We help optimize pension payout options, assist with company retirement plan rollovers, and help maximize their social security benefits to maintain their standard of living during retirement. We manage required minimum distributions and their impact on income taxes, as well as utilizing our certification in long-term care to develop a plan of care should the need arise. Busy executives value our knowledge when assisting them in managing their company stock options, RSUs, deferred compensation plans, and maximizing employer plan contributions while developing a solid investment strategy for these accounts. When transitioning between employers, they count on us to guide them through benefit and relocation decisions. We are proactive in helping them avoid unpleasant tax surprises due to annual bonuses and stock-based compensation. 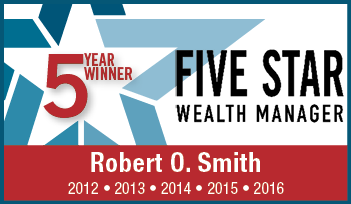 The Five StarSM Wealth Manager Award is based on 10 objective eligibility and evaluation criteria, including a minimum of 5 years as an active credentialed financial professional, favorable regulatory and complaint history, accepts new clients, client retention rates, client assets administered, education, and professional designations. 2,671 Philadelphia wealth managers were considered for the award; 660 (25 percent of candidates) were named 2016 Five Star Wealth Managers. (The criteria provided reflects the most recent year for which advisor received the award. The criteria used, the number of wealth managers considered for the award, and the percentage of those who receive the award, may vary from year to year). These awards are not indicative of the wealth managers' future performance. Your experiences may vary. For more information, please visit www.fivestarprofessional.com.